At the beginning of the year, I tend to catch up on my "adult" reading--Smithsonian and National Geographic, nonfiction, business and craft books, and the like. I'm currently reading Hothouse and I just finished and was wowed by Jumped by Rita Williams Garcia (not an adult book, but in one of the to-read piles that was easier to read than to box up, since I'm packing books at the moment). 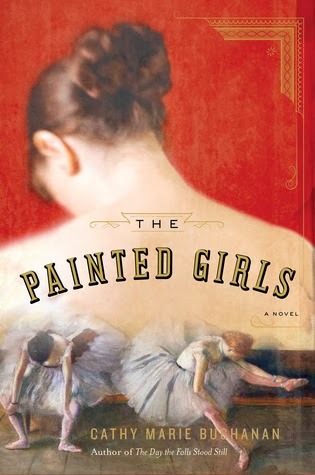 And then I was gifted The Painted Girls by Cathy Marie Buchanan (Penguin - Riverhead). This is a historical novel about girls--who could be YA if this were pointed in that direction--living in not-quite-fin-de-siecle France. The oldest of three sisters, Antoinette, has lost her place in the ballet, and is pulled toward a fascinating boy who, as she says, makes her feel adored, but may be her ruin. The middle sister, Marie, earns a place in the ballet for herself, as does the youngest, Charlotte, while Antoinette takes a job as an actress. They all work because they love the work, but they also need to support themselves. Their father is deceased, and their mother a laundress who loves laudanum best. Alternating between Antoinette and Marie, we get a picture of the life of the poor in Paris--the poor who will take second jobs in a bakery before ballet rehearsal, the ones who might take on jobs that involve the sale of their dignity, if it comes to it. Antoinette, prostitution, just enough to save money for the journey to New Caledonia, where her jailed lover will be sent, and where she hopes to join him and to start a new life once he's freed. Marie, to keep the family together, will pose for Degas, who is painting and, in her case, sculpting ballet girls--and when she must, for a patron whose palette is only for show. The space between rock bottom and just above is very narrow, and narrower still once the sisters find that living without one another would be a terrible agony. 3. And it's based on some real people, though not all real relationships. 4. And it's an interesting peek at some of the values of the time. 5. This would make a great book club read.